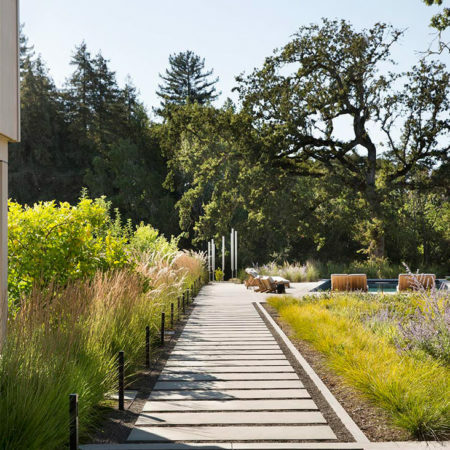 Arterra is a full-service landscape architecture firm specializing in contemporary, sustainable design. We collaborate with our clients and their design team, providing imaginative solutions and clear communication. The Arterra Team is a diverse and slightly quirky group of creative and nerdy individuals. We are dedicated to the art and the craft of our profession. We consider it an honor and a privilege to do the work we do — and we do it well. We share ideas and inspiration in our beautiful, open studio space, where design ideas come to life. We are dedicated to doing sustainable work, and living sustainable lives. 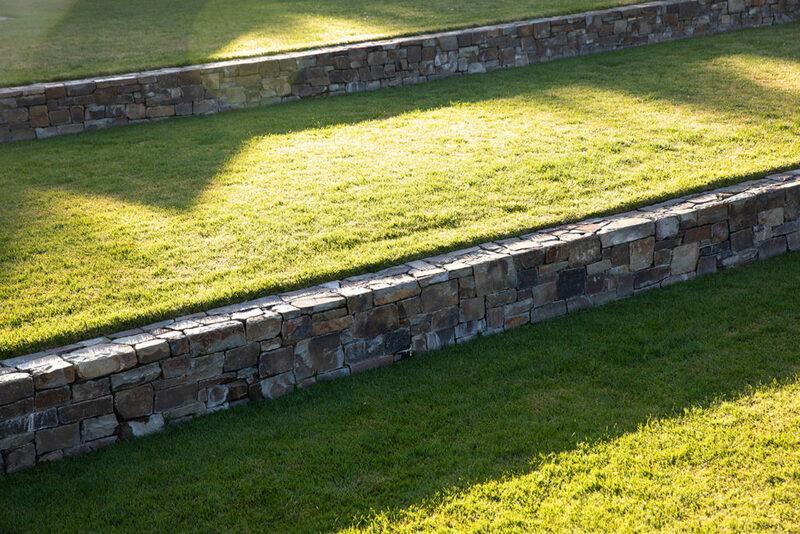 Our greatest achievement is creating a meaningful and sustainable landscape legacy. We welcome your queries and commissions. 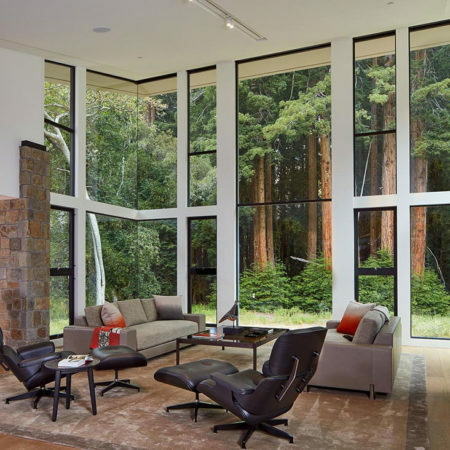 Driven by the stand of towering redwoods, this house responds to its context with quiet elegance. 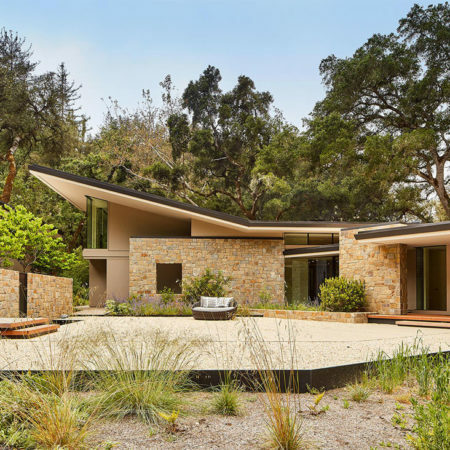 The house and landscape fluidly speak the language of the site. 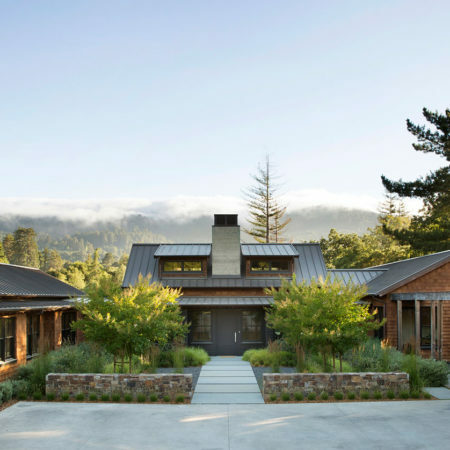 Angled roofs capture the verticality of the redwoods and distant views to the ridge beyond. 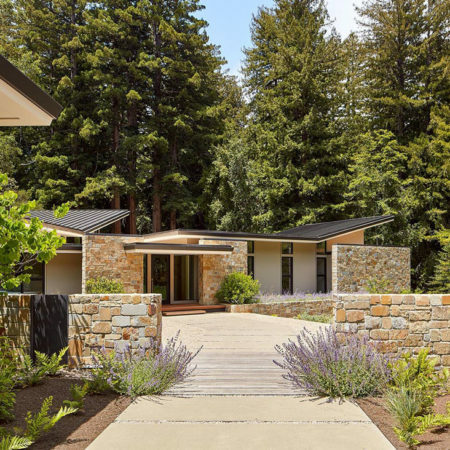 Courtyard walls, planters and gravel terrace echo the strong horizontal lines of the meadow. Using the clues from the site, the planting palette is native driven. 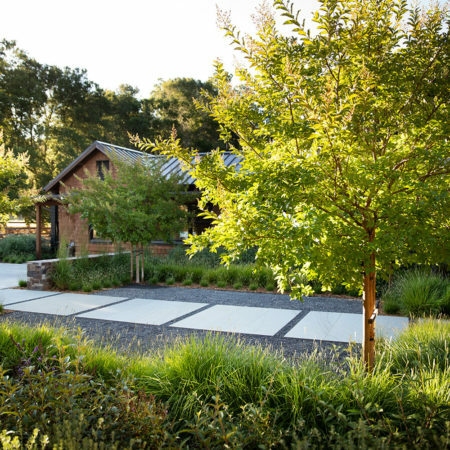 Drought tolerant grasses, perennials and ferns celebrate the meadow setting. 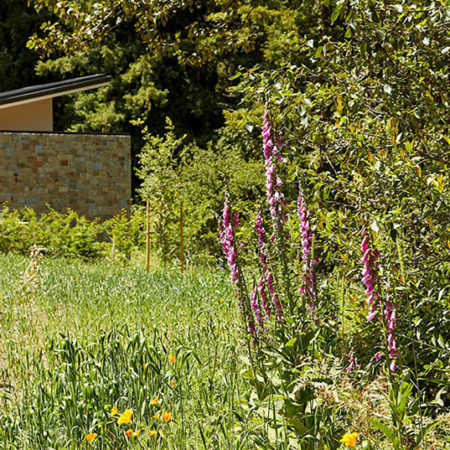 Toyon, western redbud and native dogwood, speak to the woodland edges. 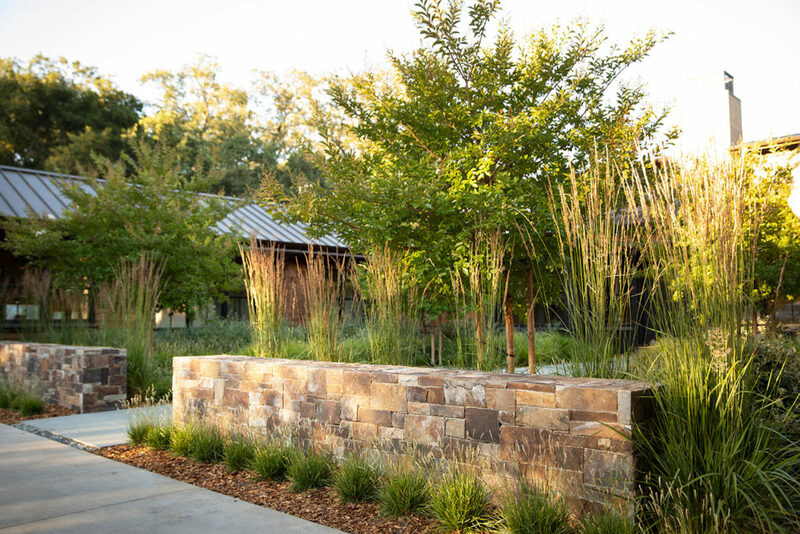 This indigenous planting style along with the courtyard fountain attract birds delighting our birdwatcher clients. 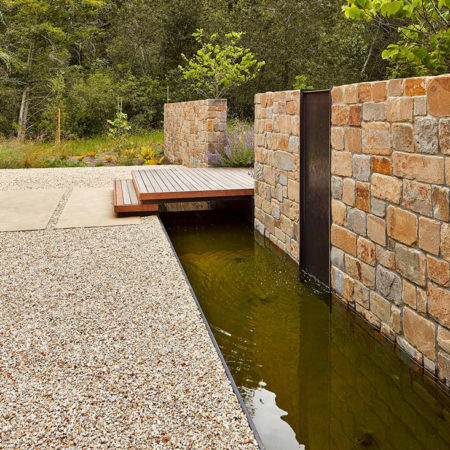 Stone walls with a bridge over the water feature create a memorable entry approach. 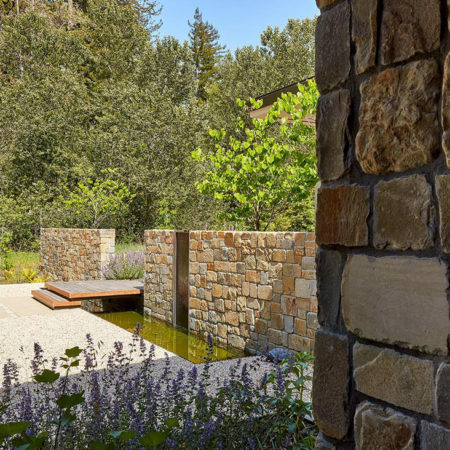 Falling water over the steel weir punctuates the wall and creates a soothing courtyard experience. 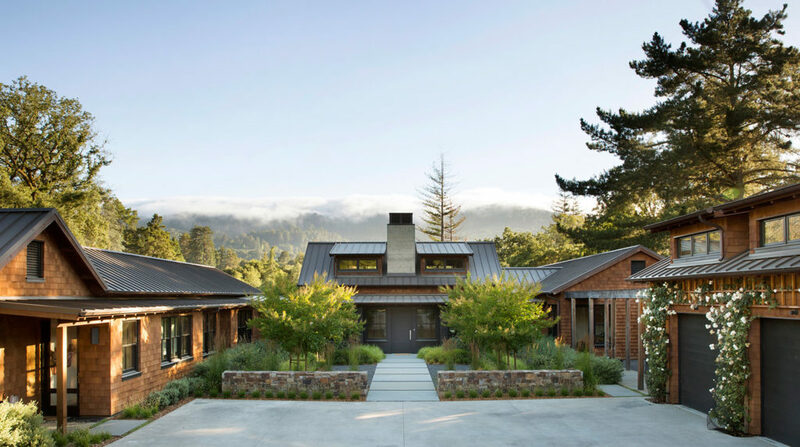 The result is a home and landscape that fully embodies the spirit of this unique environment. 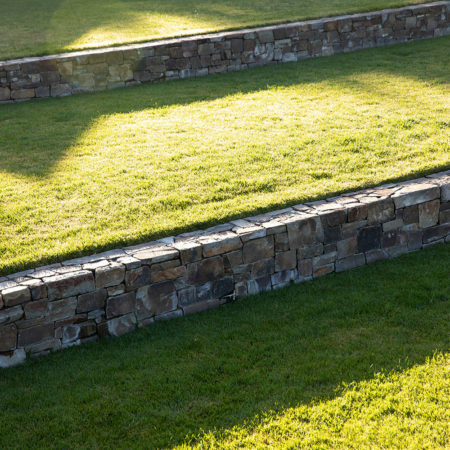 Geometric order is the framework that organizes this harmonious landscape. 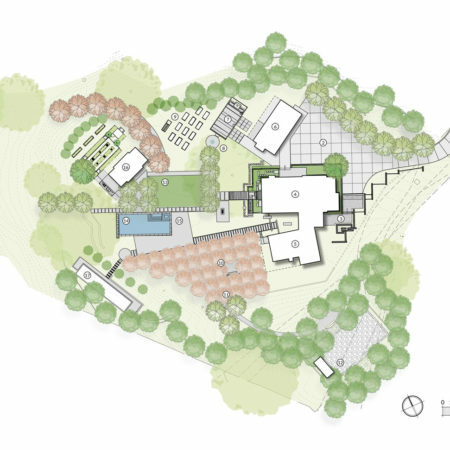 The garden is organized from a single point, integrating the angles of the house and extending the architecture into the oddly shaped lot. The result is a graceful sequence of space and form that feels infinite. 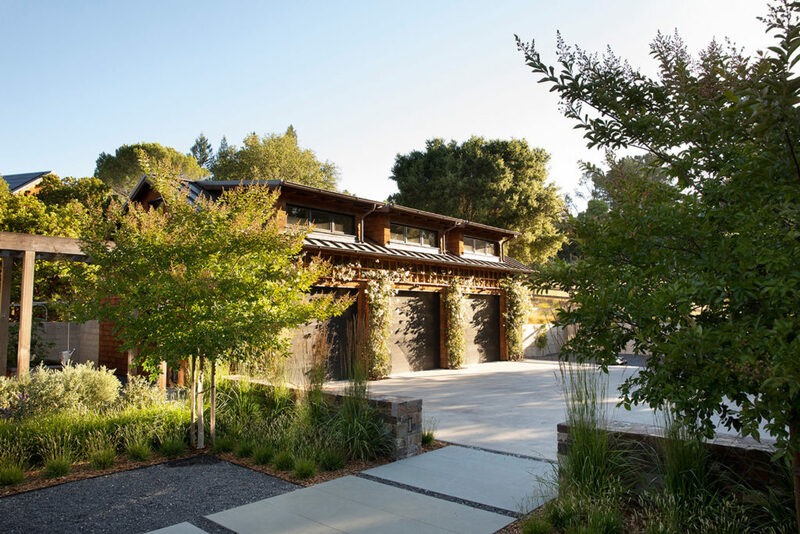 The deceptively simple design at the front entry conceals a confounding tangle of utility chases and pre-existing retaining walls. 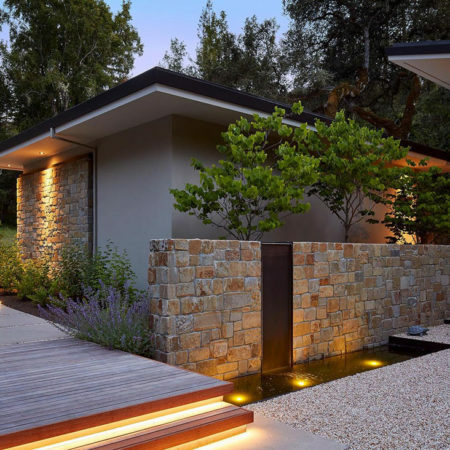 Strong, parallel concrete walls march toward the front door culminating at the fountain. 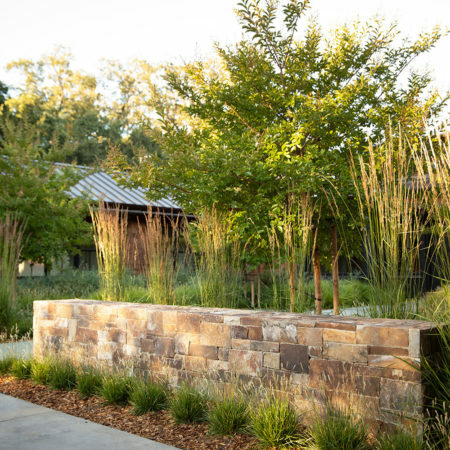 Low steel walls retain the soil, while soft plantings of muhlenbergia and manzanita spill gracefully between. The limestone paving surrounds the fountain, continues into the house and extends beyond to the courtyard in the back. 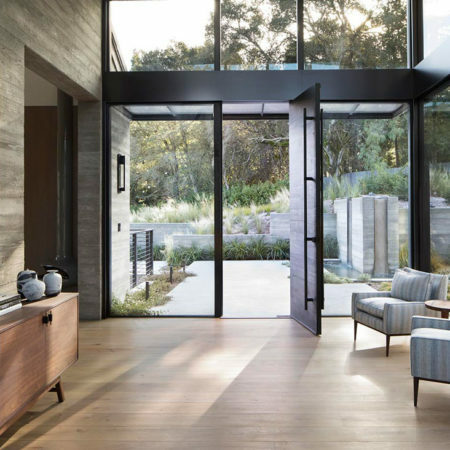 Through the entry foyer, the angled courtyard becomes the fulcrum of the design. From here the garden fans out with a series of linear paths and a sequence of garden rooms, each relating to a different wing of the house. 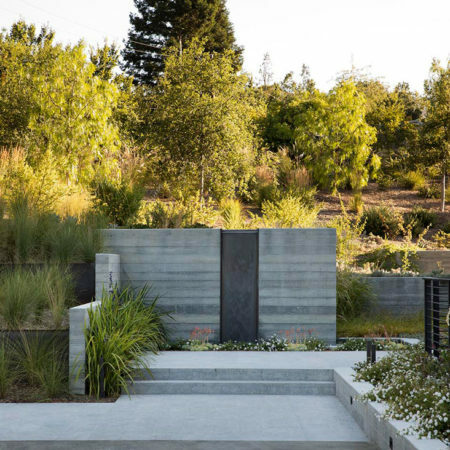 One long stone band extends from the fulcrum point to a circular gravel terrace with a sculpture of musical chimes which terminates this axis, and redirects the journey to a lower terrace and bocce ball court. 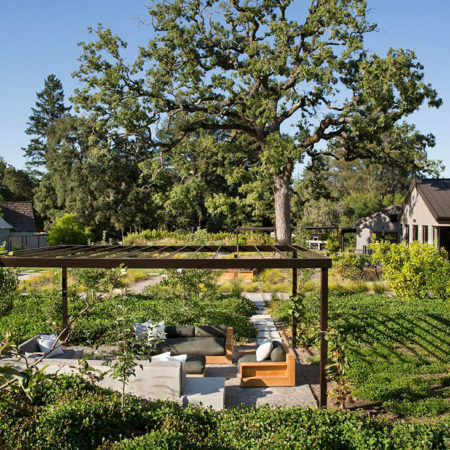 Following this path and the geometry of the southern wing of the house, a robust orchard of fruit trees provides a cozy haven for an intimate seating area shaded by a steel arbor covered in kiwi vines. 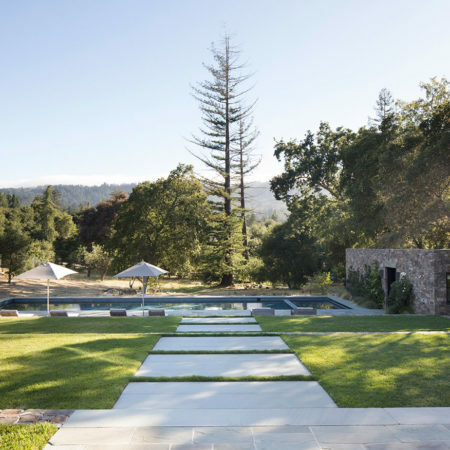 Positioned between the orchard and the guest house, a series of outdoor rooms reveal themselves as one moves through the garden. 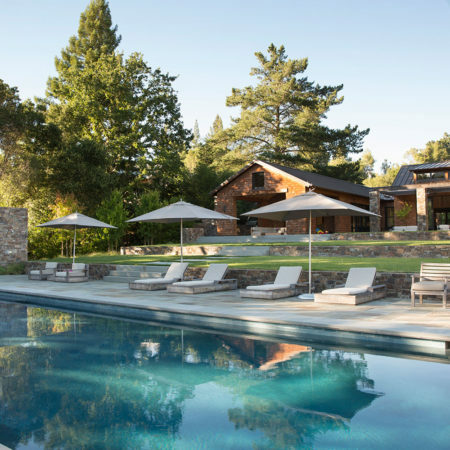 Aligned with the northern wing of the house, the existing pool is anchored by a new gathering spot. 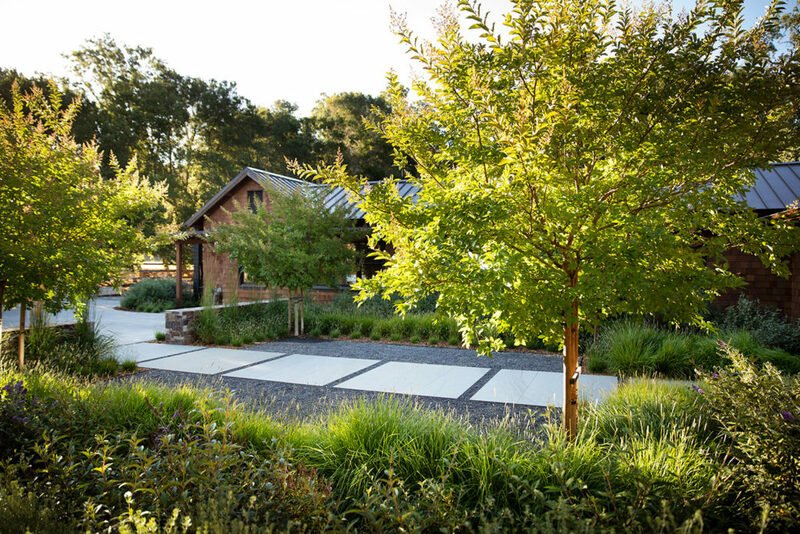 Portola Valley is a community that honors its past. People are drawn to this small town with its rural setting that strives to preserve natural beauty and open space. Small farms and homesteads dot the valley. 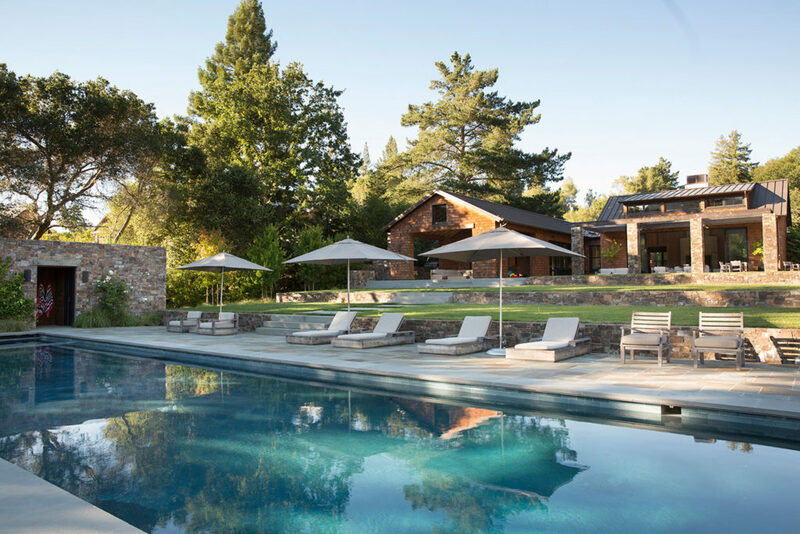 Equestrian trails line the roads and wind through the Coast Live Oak and Valley Oak woodlands. Kids walk to school on trails. The Town Hall and library complex is host to a weekly farmers market. Life is intentionally different from the neighboring sprawl of Silicon Valley. Understanding this community context was key to designing the property. 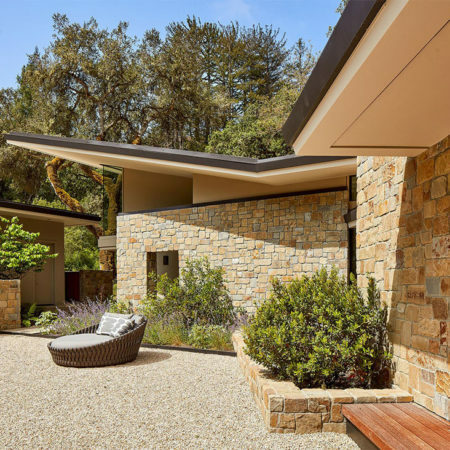 The straightforward character of the house and site design are a direct reference to this heritage. 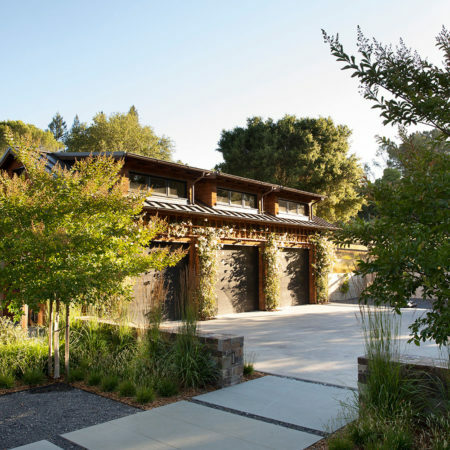 The property was originally an equestrian lot. 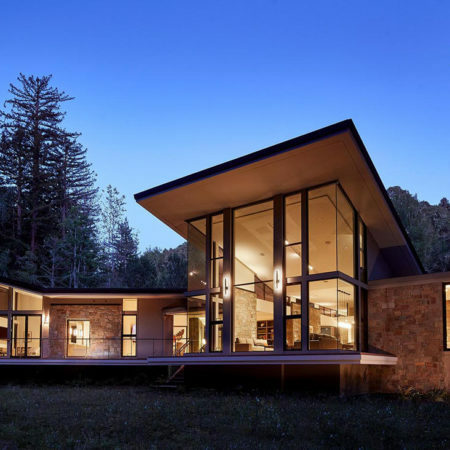 The previous residence sat in the upper wooded hillside and was in disrepair. The lower, more open portion of the lot contained an aging stable and abandoned paddocks. Situated in the low point of the neighborhood, the site was the recipient of a significant amount of watershed runoff. 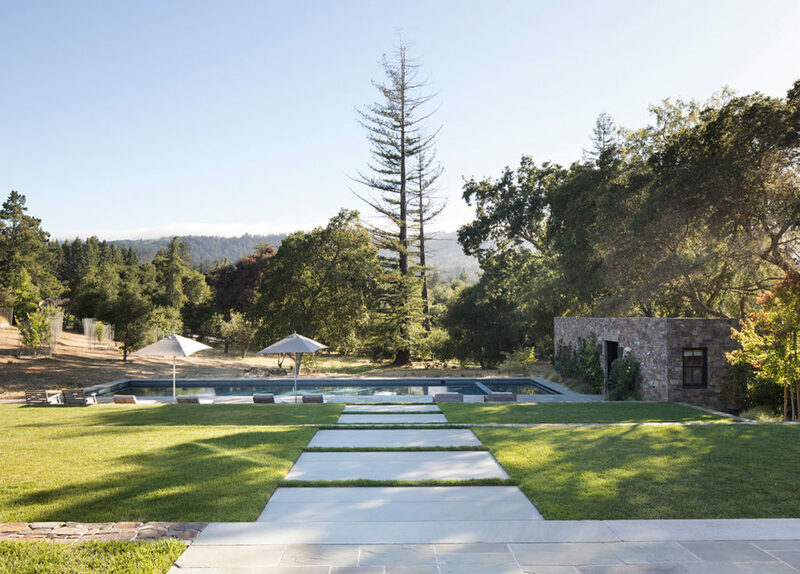 Heritage oaks & redwoods and an existing orchard set the stage for dramatic view to Windy Hill to the west. 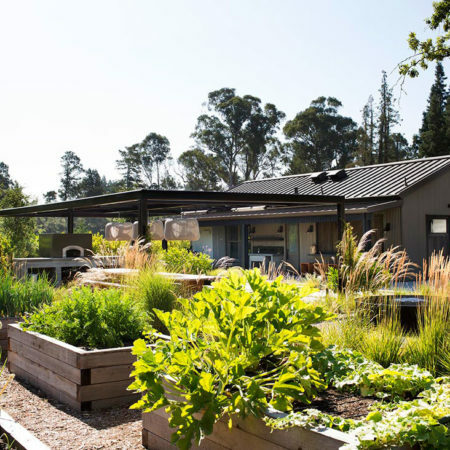 The redesign of the property presented an opportunity to restore the land while creating a home for a family of 5 with young children. 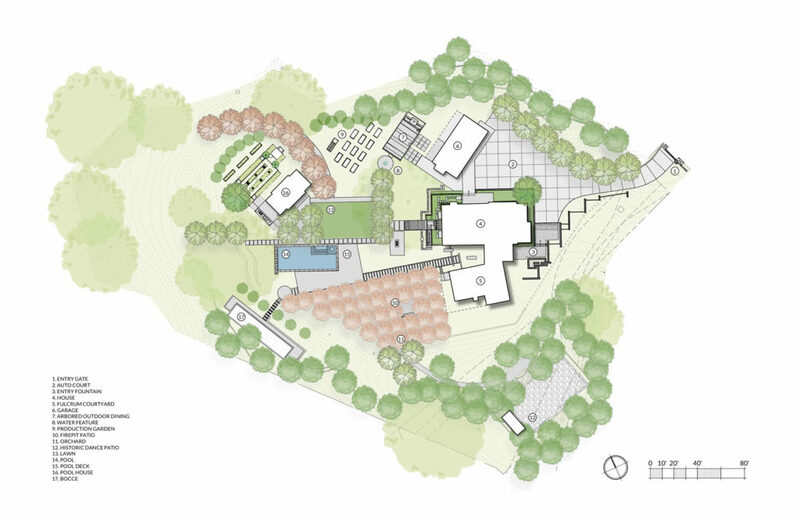 Working closely with the architects, the landscape architects were instrumental in studying access routes into the site, massing, positioning & setting elevations for the buildings (house, office and pool cabana) and designing the activity areas ( pool, kitchen garden, orchard & discovery trails).